Best Evidence in Emergency Medicine (BEEM) is a knowledge translation and dissemination project. Dr. Andrew Worster of McMaster University started it in 2005. It provides up to 12hrs of continuing medical education per course. BEEM does not have any financial or other affiliation with any commercial organization. BEEM Mission: To provide Emergency Medicine practitioners with the best clinical evidence to optimize patient care. BEEM Vision: To be the most valid, reliable, and unbiased global source of current clinically relevant patient-centered medical knowledge for practitioners. 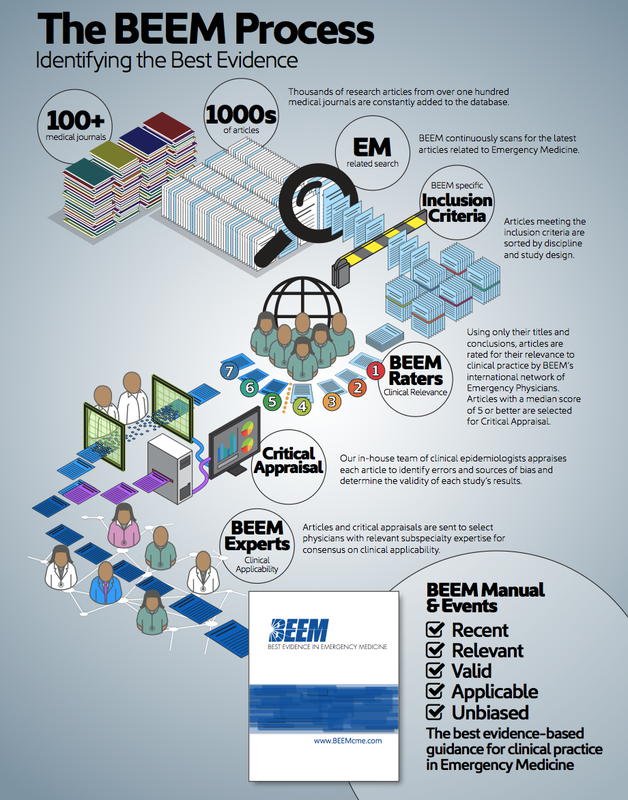 BEEM has the only validated audience rating tool in emergency medicine continuing medical education. Worster et al. Consensus Conference Follow-up: Inter-rater Reliability Assessment of the Best Evidence in Emergency Medicine (BEEM) Rater Scale, a Medical Literature Rating Tool for Emergency Physicians. Acad Emerg Med Nov 2011. The BEEM rater score, to the best of our knowledge, is the only known measure of clinical relevance. It has a high interrater reliability and face validity and correlates with future citations. Carpenter et al. Best Evidence in Emergency Medicine (BEEM) Rater Scores Correlate With Publications’ Future Citations. Acad Emerg Med Oct 2013.